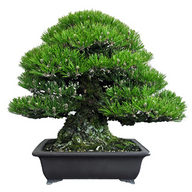 Takamatsu City is known for quality Bonsai production around the world today. It is said that, in Takamatsu, the art of Bonsai began during the Edo Period when the local people replanted pine trees, which were found naturally in mountains along the Seto Inland Sea. These plants have been lovingly pruned and trained in pots. Kinashi areai is the heart of the Bonsai industry and well known for the Pine Bonsai with 80% of the domestic market share along with Kokubunji area. From these two exceptional areas of Takamatsu, beautiful works of art have been exported outside the country and gained high reputation as exemplary Bonsai. We hope you will enjoy experiencing the world of Bonsai with us!